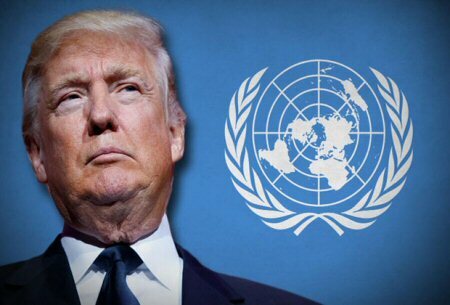 US President Donald Trump has decided to stop funding for the United Nations Relief and Works Agency for Palestine Refugees (UNRWA), months after the agency scaled back its financial support, US magazine Foreign Policy said on Tuesday, according to the PNN. The US magazine quoted unnamed sources saying that Trump’s decision was taken during a meeting in early August between Trump, his adviser Jared Kushner and Secretary of State Mike Pompeo. The magazine said that the US administration had informed regional governments in the past few weeks of the decision. The United States provides about $350 million annually to the UNRWA, more than any other country, representing more than a quarter of the organisation’s annual budget of $1.2 billion. The United Nations agency is already suffering from a financial crisis following Washington’s freezing of $300 million of its aid this year. The United Nations says UNRWA needs $217 million, warning that the agency may have to cut its programs sharply, including food and medical aid. UNRWA was established by a resolution of the United Nations General Assembly in 1949 to provide assistance and protection to Palestine refugees in its five areas of operation: Jordan, Syria, Lebanon, the West Bank and the Gaza Strip. On December 6, US President Donald Trump announced the recognition of occupied Jerusalem as the capital of Israel and the transfer of his country’s embassy to it, sparking Arab and Islamic anger and international warnings.